In June 2019, a new Year 4 multiplication tables check will be trialled across the UK, becoming statutory in 2020. Your child will need to take a short online test to make sure their times tables knowledge is at the expected level. We’ve gathered together everything you might want to know about the times tables check, including what it involves, when it will take place, and how you can help your child prepare. You will also find our top tips to help make your child’s times tables practice fun on the attached letters. World Number Day - Friday 1st February 2019. Non-uniform day - thank you for the money we raised for the NSPCC last Friday! The children, from Nursery to Y6, had great fun celebrating numbers and maths in a variety of ways; outside building snowmen, counting the animals in twos onto the snow-covered ark, shape puzzles, bar modelling, mazes, reasoning, creating maths games and finally to the winners of, 'Who Wants To Be A Mathsionaire!!' Great fun while supporting a wonderful charity! Thank you again, Mrs Kevan. 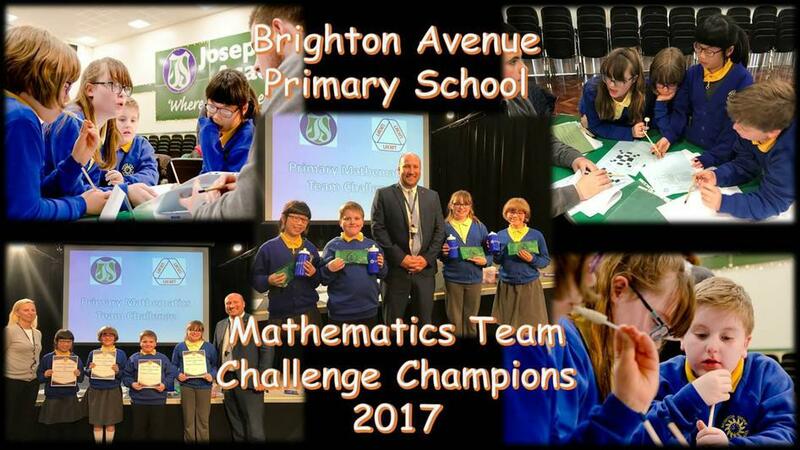 At Brighton Avenue Primary, we believe that mathematics equips pupils with a uniquely powerful set of tools, helping children to make sense of the world around them through developing their ability to calculate, to reason and to solve problems. It enables children to understand and appreciate relationships and pattern in both number and space in their everyday lives. Through their growing knowledge and understanding, children learn to appreciate the contribution made by many cultures to the development and application of mathematics. 1. Develop a positive attitude to maths as an interesting and attractive subject. 2. Improve pupils' understanding, enjoyment and attainment in mathematics. 3. Develop mathematical understanding through systematic direct teaching of appropriate learning objectives. 4. Encourage the effective use of maths as a tool in a wide range of activities within school and, subsequently, adult life. 5. Ensure the teaching of greater depth and breadth (mastery and challenge) forms a key part of work within maths planning; mathematics is something that we want pupils - all pupils - to acquire, or rather to continue acquiring throughout their school lives, and beyond. 6. Develop the ability to use mathematical facts and fluency to reason mathematically. 7. Develop an ability in the children to express themselves fluently, to talk about the subject with assurance, using correct mathematical language and vocabulary. 8. Develop an appreciation of relationships within maths. 9. Develop ability to think clearly and logically with independence of thought and flexibility of mind. 10. Develop an appreciation of creative aspects of maths and awareness of its aesthetic appeal. 11. Develop mathematical skills and knowledge and quick recall of basic facts in line with government recommendations. On Wednesday 18th October afternoon, Mr Gallagher was with a team of four children (two from Y5 and two from Y6) who had to answer a wide range of complicated problem solving questions. The challenge was to see which children could correctly answer the questions first, explaining their methods and reasons why. We were against other Y6 children teams from local primary schools. The good news is we won! WOW – AMAZING! The adults, from Joseph Swan Math’s Department and the U.K.M.T, were blown away by the speed with which we solved the problems. All the children and staff here at Brighton Avenue are so proud! Well done! We can’t wait for the next competition!